Like many boys his age, Hermann loved to climb trees. The lively eight-year-old was confident. He strove to mimic the effortless skills of the Guatemalan Howler Monkey native to his country’s forests. During one climb he reached for a higher hold. Hermann lost his grip, slipped, and fell nine feet head first onto the pavement. Doctors offered little hope for the unconscious boy who was rushed into their care. Even so, his mother kept a prayerful vigil at his bedside. After several days without improvement, the neurologist told her that Hermann would not make it. Even if he did, the doctor claimed that Hermann would be brain damaged. But his mother would not give up. Hermann’s uncle repeated the doctor’s words to her and said, “Be ready for the Lord to take him home.” He was preparing her for the worst, but it only made her dig in deeper. She was angry at God until her sister came to pray with her and said, “Give your son to the Lord.” She heard the wisdom in that counsel and finally surrendered praying, “I live for the glory of God. If Hermann lives, Lord, let him live for your glory. If not, he is yours.” Her son woke up the next morning as though nothing happened. There was no neurological damage at all, save a slight cast in his right eye. Guatemala is less than half the size of Oregon. Sitting astride the Ring of Fire, it has 37 volcanoes, some of which still plume. When Spanish Conquistadors arrived, they drove most of the Mayan people into the mountains seizing the region’s fertile plains. They enslave others and imposed Catholicism on everyone. Today, most of Guatemala’s 50 million people are nominally Catholic but retain some belief in their ancestral gods. Hermann grew up in a family with a rich legacy of faith, the oldest of five siblings. And they are very poor. Most villages lack electricity or running water. Those with homes live in bamboo shacks and adobe homes. Poverty was something shared by most Guatemalans. Ever mindful of his people’s physical and spiritual needs, Hermann’s grandfather was the pastor of a church in the city who often went to plant churches in remote Mayan villages. Hermann’s mother, a teacher, was a leader in Granddad’s church. His father opted for a career in firefighting, risking his life for people he did not know. Both gifted Hermann with a legacy of service. Hermann drank the brown, untreated water and never got sick. Had God made it holy? As their stay came to an end and they were leaving the village, a lady stopped them, “Please come and pray for my daughter. She is feverish with vomiting and diarrhea.” The group was in a hurry to catch the last bus home, but Hermann still went with the woman and prayed for her daughter. He recalls praying the fastest, most uninspiring prayer he had ever prayed. He had to finish fast so he could catch the bus. When Hermann returned with his family the following Sunday, the mother stood up in the service. She declared, “Twenty minutes after you left, my daughter was completely healed.” Hermann remembers that the church in this village began on that day. Every one of those villagers had seen the power of God and they responded in faith. Sitting at a table, enjoying the alluring aroma of Guatemalan coffee rising from his cup, Dr. Alb shares how the Lord led him to become a missionary doctor to his country. Hermann had a front row seat to miraculous happenings throughout his teen years. But he felt the tide of his life pulling him from ministry and in a different direction. He recalls his uncle, a physician, saying to him, “Hermann, become a doctor. It‘s a money tree.” Determined to rise above the poverty of his childhood, he resolved to do so and worked hard to earn his MD. Along the way, he married Linda, a teacher, who he had met at a Christian youth conference. They looked forward to a good life filled with good things. And, of course, he planned to use his wealth to serve God. As he finished medical school, his pastor invited him to help him with medical clinics in rural villages. He saw many patients and many healings, both medical and miraculous. Besides the care they provided, the team shared the Gospel in every village. Hermann was again impressed by the powerful presence of the Holy Spirit. As he was driving the team’s van back to Guatemala City on one particular trip, the others were singing worship songs. Without warning, God said to him, “My son, I have chosen you as a pioneer. What you have seen these days is nothing compared to what you will see. Serve me and I will bless you and prosper you.” Weeping with joy, Hermann pulled the van to the side of the road. When he told Linda about it, she said, “If the Lord said so, let’s do it.” With that, the course of their lives changed. Hermann thought he knew why he wanted to be a physician – so that he would not be poor. Now he understood why God wanted him to be a physician – to bring the word of God to the people of Guatemala. But there would be no money tree. And so there were challenges. As they began, a benefactor gave them a wrecked 1977 Toyota. They had to pay $400 to fix it. But they trusted God and he met their needs in small and unexpected ways. Hermann began crisscrossing Guatemala, healing people and sharing God’s love. He and Linda teetered on the edge of poverty but they kept recalling God’s words. They were certain that he would take care of their family as they focused on his work. They remained frugal and were finally able to set aside a little money each month for a house. They were getting close to their financial goal when God said to Hermann, “Give the money you saved to your pastor.” He shared that with his wife, sure she would balk. Linda said yet again, “If the Lord says so, then let’s do it.” Far from suffering lack after giving away their savings, God began to bless them. Medical teams from the U.S. started to contribute, providing resources for their missions. The ministry Hermann and Linda founded began to grow in reach and influence, as the fragrance of God’s work among them spread ever farther. Every morning when Dr. Hermann Alb wakes up, he sees a cross-eyed face looking back from the bathroom mirror while he shaves. His skewed eye is a memento of God’s miraculous hand on his life. He has thought about having surgery to fix it but always relented. He likes the reminder of the faithfulness into which he was born, and of the faithful God who can do anything. Fourteen hours of flying in the economy section. Not something I was looking forward to when I boarded the Emirates flight to Dubai. The span of my shoulders is 2 inches wider than the standard airplane seat. At least I had on the aisle, so I could lean towards it and not intrude on the space of the person who was unfortunate enough to have the middle seat. While waiting to board, I saw another wide-shouldered guy in line behind me and considered the odds that he would be next to me in the middle seat. No way! Yep, he was. We joked about our misfit for these seats as he sat down. Gary was on his way to Afghanistan. He retired from the military two years ago and is now an intelligence contractor. He was home with his family for a few weeks over Christmas break and now on his way to a nine-month deployment. When I told him I was a pastor, he asked me, “so will you give me a biblical, theological answer to the question of war?” He had given up on faith on his first deployment. What unfolded over the next hour was a transparent and soulful search for answers. Gary grew up Catholic. He got involved in an evangelical youth group when he was fourteen and he was all in. He studied the Bible. He felt called to be a youth pastor. He met the girl he would one day marry in a church group. Then he went to war. The carnage he saw blew up everything he believed about this world and the God who created it. To him, the evidence no longer added up to what he thought he knew of God. Gary’s wife was still a strong believer, has a Bible study group, and prays for him to come back to faith. And here he was crammed on a plane on a fourteen-hour flight next to a pastor. I remembered reading of a man who said, “I don’t believe in God anymore… but I miss Him.” Everything in me said that Gary was like that man. The longing was there, but the obstacles were seemingly insurmountable. So, doubt-by-doubt, obstacle by obstacle, we explored the questions that remained unanswered in the God he knew in his youth. I took my Bible out and we searched the Scriptures for things that spoke to his doubts—precept upon precept…. line upon line… here a little, there a little. I sensed the powerful presence of the Spirit during our conversation. As we wound down our discussion, Gary thanked me. He said I gave him some answers and some things that he would be considering as he explored the possibility of a renewed faith. I encouraged him to get a Bible again and open His heart to a God who would speak to him in the midst of the doubts that vexed him. He asked me to pray over him. So, at 38,000 feet over northern Canada, I was able to pray for a man whose journey was surprised by an encounter he didn’t expect. Gary was deployed to serve the military. His role in signal intelligence was complimented by others who worked on other kinds of intelligence. He spent most of his time pouring through details in order to find anything that could shed light on the situation in the field. We are both collaborators. I was on my way to Nepal— deployed by my church to work with a Christian school that is giving children a hope to be something more than an indentured servant for life, a certain fate for most of them. Or maybe I was deployed by the faithful prayers of his wife to collaborate with Gary on a long flight. Or both. Praise God. What a week! From the opening day until the curtain fell it was a world-class camp. It gets better every year! Tektronix generosity in providing the fields and the water. An enthusiastic and energetic “glow-stick dance time” at the celebration – way to rock it Jamie and Israel. And about 200 very happy campers. From the outset we talked about creating a Kingdom environment, a veritable bubble of shalom from the Holy Spirit. A place of peace where the kids would encounter love and acceptance from the people of God. For some it may have been their first time to encounter Jesus’ people. We affirmed lavishly. We reminded them again and again that they are fearfully and wonderfully made by their Father in Heaven – a Father Who loves them! One of our volunteers got invited by one of the Hispanic moms to come to her apartment at Ecole and learn how to make authentic Mexican food (she can bring a few friends, too). We (the Soccer Staff) were invited to Merlo Apartment’s Summer BBQ because the apartment manager sees the love we have for the kids. And another of our volunteers is already planning ways to continue to bless that community and the kids who live there. Finally, seven kids from the camp who are aging out this year have indicated their desire to serve next year. This is an outreach camp. Last week the love of Jesus has touched our community in a profound way! Covered in prayer by so many people, why would we expect any less? His name is Boy – the name given to him by his grandfather. He is a water well driller. 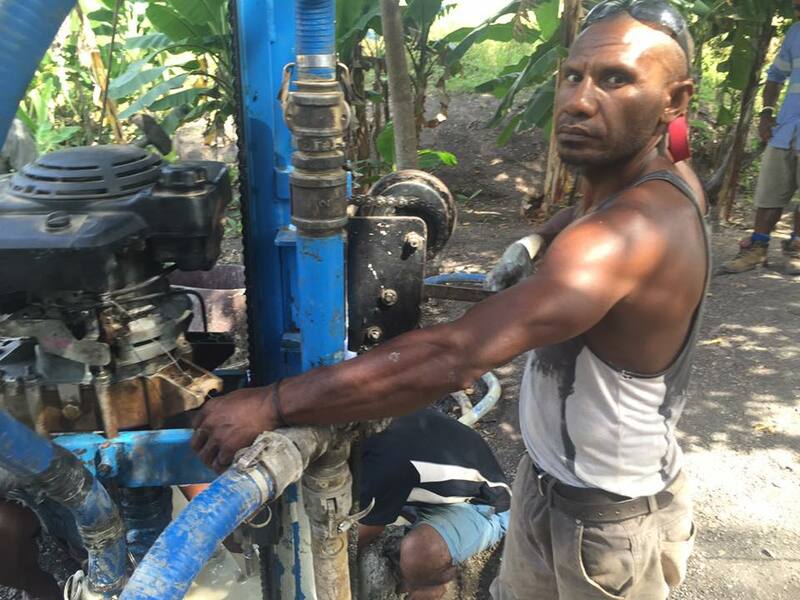 Born and raised in the highlands of Papua New Guinea (PNG), this father of two now spends most of his time in the Port Moresby area drilling deep water wells in order to provide water to the rural villages in this part of the country. He wants people to have water, but more so, he wants them to find out about the Living Water of Jesus Christ. As I write this, I am flying on Fiji 290 over the South Pacific on our return flight from Papua New Guinea — cutting a high altitude path between deep blue sky and deep blue sea. Jim and I just completed what I have come to call a guerilla mission – a description I give to those short, intense missions when we have a very specific goal and a fixed amount of time to complete it. We were invited by Pastor Magi Goro to come and assist them in making improvements to their water ministry. 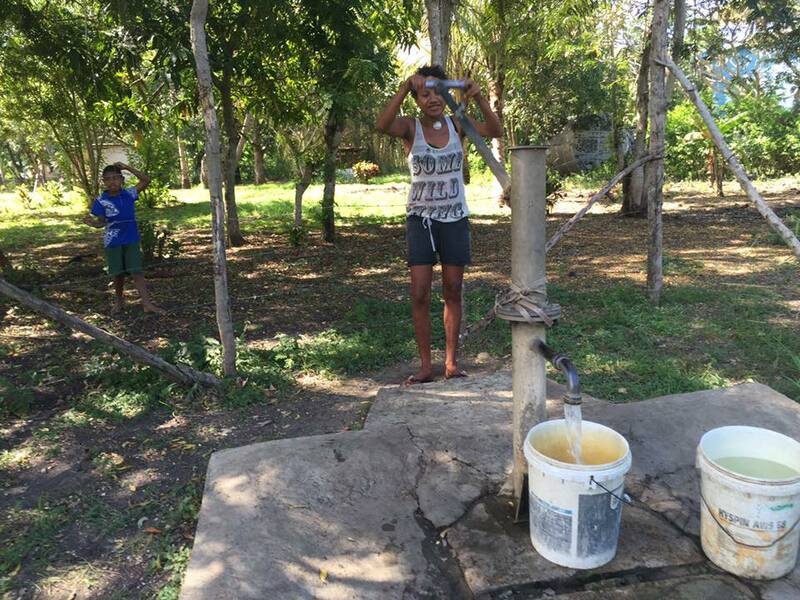 Unless you live in the urban Port Moresby area, your options for water are few. The average person needs from 10 to 15 liters of clean water per day for drinking, cleaning and food preparation. In most of Papua New Guinea that means traveling long distances with buckets for fetching water. The drought they have experienced over the past several years has made many surface options dry up. People are getting sick and dying in the villages as they are desperate and drink from sources that are unclean. Deep-water wells are essential to make clean water available in these parts. It is the very heart of Pastor Magi to make a dramatic impact on the health and life of the villages. In the past several years he has drilled 45 wells. And everywhere he has drilled a well he has planted a church. Jim and I visited quite a few sites. Some were producing water, but many were in need of repair. It is no easy task for Pastor Magi to run a well drilling ministry. He works on a shoestring budget with old equipment. He spends an inordinate amount of time fixing the drill rig and the well parts that rust from the high iron-content water. He has a desire to keep providing water and planting churches, but the maintenance needs have reached critical mass. Furthermore, even though the wells provide water, drinking water is still a concern. They village folks are very suspicious of groundwater from so deep. They will use it for many of their needs, but are unwilling to drink it. Jim and I have benefitted from doing a number of water projects together around the world. Jim’s experience with providing water alternatives is broad. Having assessed the operation, we were able to make a number of low cost suggestions that will help reduce repairs the amount of maintenance needed over the life of a well. But the drill rig is over ten years old and being kept running by the equivalent of baling wire and duct tape. Pastor Magi has been setting money aside in order to get a new rig (around $10,000 USD). We focused not only on wells, but also on water quality. The PNG team told us from the start that they were not very knowledgeable about water quality. They knew how to get water out of the ground, but did not know how to instruct the villagers on making it drinkable. We held a training session on Tuesday to help them understand about the major contaminants in water that make people sick and ways to purify well water. By the end of the session, they had gained new confidence and felt they could give the villagers ways to test and treat the water for drinking. The men and women we spent the past several days with are incredible. The Holy Spirit is at work in them as they pour themselves out for the sake of their people. We were honored and blessed to be able to work alongside such inspiring brothers and sisters. They are doing a great work. It is not only about clean water, but about bringing the good news of Jesus Christ and planting fellowships in villages that need the Living Water of Jesus Christ. It is about deep wells and the planting of deep roots. Please keep our PNG brothers and sisters in your prayers. If you’d like to give to accelerate their timeline for getting a rig, or for purchasing water filters and test kits, you can do so here by designating B4 Missions as the giving type and we will make sure that every dollar goes to them and their efforts. Hi pastor Mark and teacher Melinda! So far everything has been going great. I’m adjusting to the routine and flow of things here. The girls have loved learning taekwondo and kickboxing. A few of them are super serious and focused and actually have a lot of TKD potential. The others just laugh the whole time and blush when I hold the shield for them to kick. I catch them practicing on each other during the day and have to warn them not to hurt each other, but just like in basketball and all their wild, rough games, the girls just laugh off any pain and don’t get angry with each other. Amit [an orphan who is Pastor Ajay’s nephew] has been teaching what I’ve shown him to Jonathan [one of the school administrators and leaders] as well, so he is having fun with it too. I’ve also taught them kickball and a bunch of group games. In exchange, they’ve taught me cricket! I was horrible at first but I’m getting better. I think I actually prefer it to baseball :). And they have taught me a bunch of other fun group games that I will have to teach the b4 square kiddos when I return. I haven’t had any health issues other than being eaten alive by some mysterious bugs that I never actually see biting me. They aren’t mosquitoes. I think it is something in the sand. From my knees down, I look like I have the chicken pox. But the rest of me is fine. More importantly, my stomach has been fine with the food and water and I think I’m already adjusting to the heat. I actually caught myself saying brrr in the shower this morning. So far I have taken over the responsibility of leading the morning exercises and devotions for the hostel girls and leading the morning devotions for the whole school on Fridays. I helped cover a few English and math classes for an absent teacher last week. I’m going to officially start teaching an English class next week. (They have exams this week). And Jonathan hinted that they might want me to teach some science since they found out I was a science major. But we haven’t officially discussed that. Other than that I just get to play with the girls and help them during study times. I haven’t watched all of the teachers, but I have watched a couple of classes. I sat in on one class with one of the new teachers who was teaching about the body and health. She did a great job. She was very interactive with the students and had them laughing and smiling. She had them take their pulse and then run outside and take it again to see who’s was fastest. I think this teacher is a great addition to the school. The biggest need/concern I’ve noticed so far is that quite a few of the girls seem to be having minor skin condition issues, ranging from boils to rashes. I’m not sure if it’s from the quality of the well water or from insect bites or (since it seems to be worst on their hands between the thumb and first finger) if it might be from the soaps they use for washing dishes/clothes. Anyhow… it seems that they might benefit from having some kind of ointments or creams we could apply to boils/rashes. They use dettol to clean wounds, which is an iodine solution. I think having something like Neosporin might also be a good idea [we are asking Christine to send pictures and one of our nurses will take a look to see what she can recommend]. Overall, I’m having a great time. The girls are becoming less shy around me and there are fewer and fewer polite (but horribly awkward) silences between me and the rest of the staff during meal times. They treat me with extra respect and keep trying to serve me, (always serving my plate first and not letting me clear my dishes, stuff like that) which I am not accustomed to. I’m trying to just graciously accept it so far (I definitely do not want to offend them or seem ungrateful) and I’m hoping I can slowly show them that I am here to serve them, not be served. I’m being treated as a guest of honor right now but hopefully over time I will become less a guest and more like part of the staff. The girls are also teaching me Hindi using the book they use for the nursery children (it has great pictures lol. Cha is for Channa.) So far I’ve learned the first 15 letters of a seemingly endless alphabet. I’m getting pretty good at drawing them but the girls still giggle when I try to pronounce them. It pretty much goes life this… I say “jha” And then they tell me “not jha… jha.” And I say “jha?” and they say “jha! … JHA! !” So I say “JHA! !” And they just giggle some more.